Eddie, I think you’re missing the point. You’re agreeing with the RRHOF now when they have shown repeatedly that they do not used standardized, objective criteria for inducting bands/lineups and are not open about the voting and the voters. You, rightfully, have bashed the RRHOF for that in the past. But now their subjective criteria on the makeup is fine with you? You have said many times that you were friends with Eric Carr. You’ve also had Bruce Kulick on TMS. Are their contributions not worthy of induction? They played on multiple gold and platinum selling albums. They were in the band for long periods of time. Vinnie Vincent contributed as a writer/performer at a critical time. Even Singer and Thayer have now had long tenures. So, what’s the criteria? As a fan and as an advocate for the fans and for these past/present members whom you are close with, you have a platform to make your voice heard, and you should be fighting for ALL of them because their contributions deserve it. OR, do you think those other members don’t deserve to be inducted? Were their contributions minimal? If you think they were minimal, then say so. I’m sure they would appreciate the honesty. But it seems that by agreeing with the RRHOF’s reasoning, that a subjective matter of the original makeup is the adequate criteria to judge induction. We can agree that new characters would be cool (and probably make KISS a million dollars), but something like that cannot be an objective standard on which to judge the contributions of the other lineups. Let’s put it another way….what criteria would YOU use if you had a vote? Would it be, if a member simply played on a studio album? Would it be if they played on a Gold Record? Or a Platinum Record? Would it be years of service in a band, regardless of album sales? Would it be total sales while a member? Would it be writing credits? It needs to be objectively based. Let us, all of us, push for the inclusion of the band, not based on makeup, but on actual objective reasoning and demand that standardized criteria be put in place by the RRHOF. Otherwise, it is an illegitimate institution and the induction means nothing. The HOF has a MILLION issues I have railed against for years! All I simply said was I can see the logic in not inducting Tommy and Eric since they did not create what they are portraying. Wouldn’t have mattered if they would have created a different makeup. The band hasn’t done anything worth a crap since they joined. They just go out and play all the songs Peter & Ace helped create. I have a great idea, why dont they get the mini kiss band to play for them. 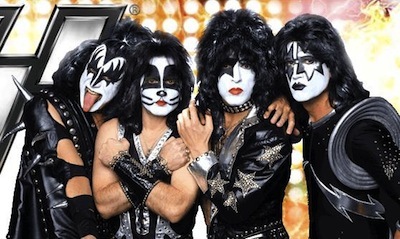 I sort see the point of the HOF- Ace, Peter, Gene & Paul were the springboard for KISS. While makeup was pertinent in them becoming who they were and are today, it would make more sense to induct the original members, since current members are merely shadow puppets of the original Ace and Peter. With the points brought up, it would make sense to induct Eric Carr since he was big contributor and had his own identity. Vinnie Vincent too, while he wasn’t with the band long, he brought credible song writing skills and had his own personae. It’s not the Mark St John, Bruce Kulick and the current members aren’t important, but makeup made KISS what they were, During the 80’s they were just another ‘hair’ band. It was a tough call for the Hall- but I sort of understand why they did it.